Simon & Schuster, 9781439187036, 416pp. Garth Stein is the author of the New York Times bestselling novels, A Sudden Light and The Art of Racing in the Rain, and two previous novels, How Evan Broke His Head and Other Secrets and Raven Stole the Moon. He is the cofounder of Seattle7Writers, a nonprofit collective of Northwest authors working to foster a passion for the written word. He lives in Seattle with his family. Visit him online at GarthStein.com. "Remarkable....Stein's prose is assured, gorgeous, and magnificently atmospheric....Cheers to Garth Stein for showing us compassion, empathy, and incredible talent." "Rich and textured...Stein is resourceful, cleverly piecing together the family history with dreams, overheard conversations, and reminiscences...a tale well told." "Set against the stunning beauty of the Pacific Northwest and told with expert angst, empathy, poetry, and mystery, Stein has created an ode to nature and redemption...in turns touching and classically sinister, with surprising twists." "Commanding...formidable...robust and well-written with beautifully clever diction and unexpected plot twists"
"Take equal parts mystery, lyrical magic, and a healthy dose of natural wonder, add a multi-generational family struggling with the ghosts of the past, literally and figuratively, and you have A Sudden Light—a beautiful, deeply thought-provoking story that is impossible to put down." "Haunting in all the right ways." "Imbued with strong, quirky characters and the smell of place, the allegiances of family and the realization of mystery...When all is said and done, and you have turned the last page, you find you have loved the journey." "Stein's beautiful writing packs a velvety punch and is pure pleasure to read. 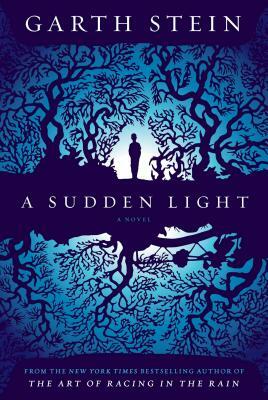 A Sudden Light entertains with suspenseful story lines and satisfies with its message of family, story, and redemption." "A 14-year-old boy trying to patch his family back together and a centuries-old ghost drive this novel's explorations of the connections between the living and the dead, parents and children, and what it means to be stewards of the land." "Heart-wrenching, poignant, joyful.... Garth Stein is a master storyteller!"